We are still counting down to Valentine’s Day next week. 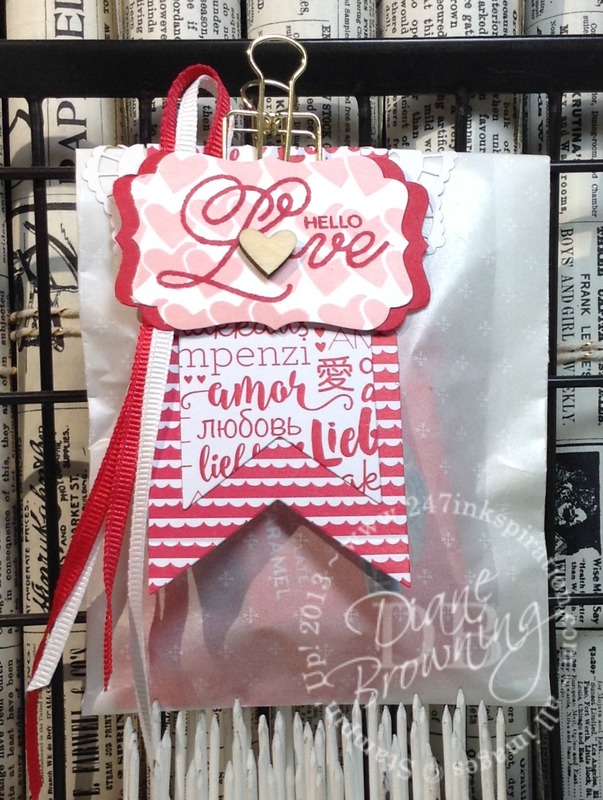 Today’s project is a cute treat bag made with the Sending Love Glassine Sheets. I love our Mini Treat Bag die because it allows me to make treat bags out of any of our papers. And when I purchase the Glassine Sheets, I thought they’d make great treat bags. The project turned out cute, but a word of warning, these sheets are super thin. It takes a very gentle touch when die-cutting these. The Glassine sheets are 6×12″ and you’ll need one sheet per treat bag. There are 10 sheets in the package so if you plan to make more than 10 treat bags you’ll need more than one package. I used my Tear & Tape to assemble the treat bag. Don’t worry, even though the Glassine sheets are thin, you can’t see the Tear & Tape strip through the paper. The tag at the top is layer upon layer of frills. Did you know the delicate doilies are white on one side and cream on the other? I love that! It means I can have cream doilies when I need cream doilies and white when I need white. I used the white side to coordinate with everything else. The tags were cut using the banners framelits and I used a bit of Snail adhesive to hold them in place while I stapled the ribbon to them. To get all those cute hearts, I stamped a small square of whisper white card stock, making sure I didn’t line up each row too perfectly. The Hello Love is stamped over the top in Real Red. Then I punched it out. I added the small wood heart over the “o”. The sentiment is attached to the tags using dimensionals. And the gold binder clip holds everything onto the treat bag. I hope you’ve enjoyed these Valentine’s cards and projects this week. Next week we’ll move on to another amazing stamp set in the Occasions catalog. Check back Monday to see what it will be.